Scientists say humans are almost certainly responsible for climate change and the world is on course for unprecedented warming over the next century. But the report reflects a gap between scientists and the general public, with growing numbers saying they don’t believe what scientists tell them about climate change. If anyone doing interviews about the report is daft enough to be reading this blog, there are a few points I would suggest making. 1. The overwhelming majority of the country do believe climate change is real and the world needs to act to stop it. 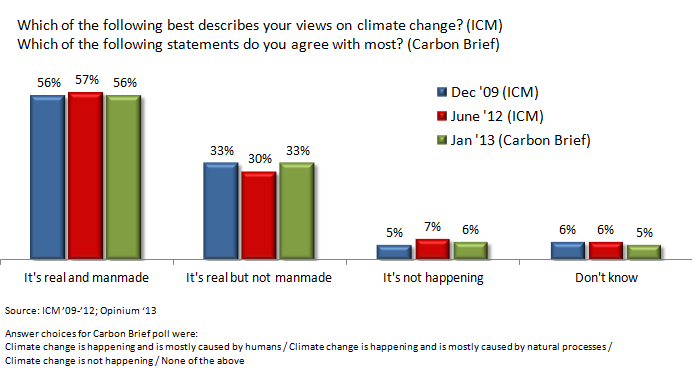 Around 9 in 10 people think that climate change is happening – only 6% think it’s some kind of conspiracy*. And only 13% – fewer than one in seven people – say it won’t be a threat to Britain. To put that in perspective, 18% say they want to get rid of the Queen and make Britain a republic: hardly a mainstream view, yet more popular than climate scepticism. Those numbers haven’t really changed for the last four years**. 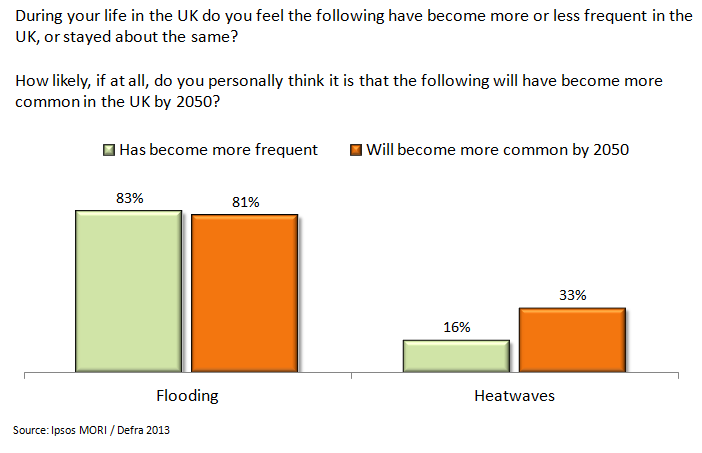 The two most important climate risks for the UK are flooding and summer heatwaves. The floods in 2007 are estimated to have cost the economy £3.2bn pounds. We usually don’t think about heatwaves as a bad thing, but the heatwave we had in August 2003 killed over 2,000 people. Both heatwaves and floods are predicted to become much more common and more severe. There are still uncertainties. Science by its very nature is never final and certain. But we know enough now to act. At this point, you may be tempted to talk about how many degrees the world is projected to warm by. Don’t. 4° warming may sound terrifying to you, but it sounds fine to most people. 3. The question is no longer whether man-made climate change is happening. The question is now: what are we going to do about it? Countries around the world have pledged to reduce the emissions that cause climate change. Even the countries that have traditionally been slow to act – like China and America – are now saying they will cut back their carbon pollution. Getting these pledges is an important start, but the world needs to do a lot more to make them happen. That includes us – the UK’s independent Committee on Climate Change says we’re not on course to meet our commitment to cut our pollution. And even if the world does cut its emissions, we’re already on course for some global warming. We have to make plans so we’re ready for it. In the UK lots of people may wonder if their home will now be at more risk of flooding and if they’ll be able to get insurance. Some people may worry about older relatives and the effect of heatwaves on their health. What are these risks? Is the government doing enough? At the moment we don’t know because the information isn’t public. This is what we should be talking about – so we can hold the government to account, to make sure it deals effectively with the most important risks, and spends our money well. * A poll this month from the UK Energy Research Centre put those who say it’s not happening at 19%. A fair bit higher than the 5% above, but still barely a quarter of the number who say it’s happening. ** In fact, they went down a bit and then came back up. But the overall effect is of no change. I agree with the first two interpretations, but the third looks to me to be a misreading of the data. Its extensive coverage in papers that would prefer Cameron to be more UKIP-like – the Telegraph, Mail & Express – suggests wishful thinking. 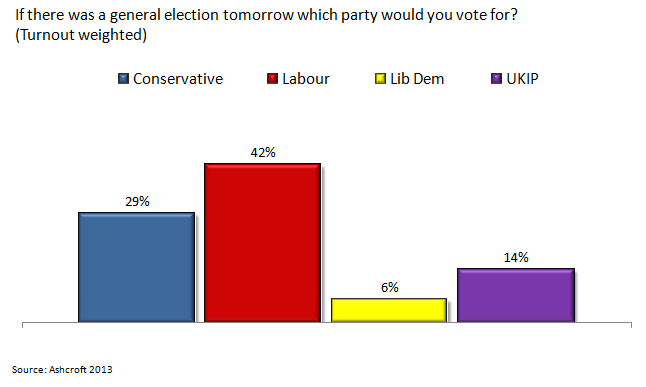 I’m going to focus on the poll of Tory-Labour marginals because that’s got more constituencies (32 vs 8) and a much bigger sample size – and it’s the one the coverage has focused on. But UKIP’s vote is 14% and Labour’s lead is only 13pts, so that means UKIP are the reason Labour are leading in the constituencies, right? 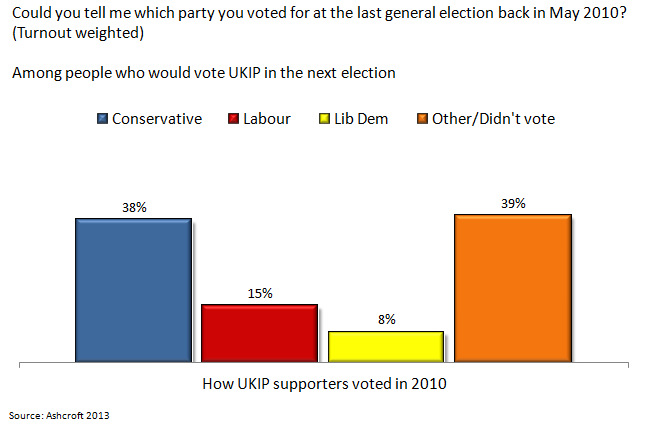 If UKIP were to disappear after the EU elections and the Tories were to be reunited with their lost voters, they would gain just 5.3pts – not nearly enough to overhaul Labour’s lead. And of course if UKIP were to disappear, some of those Labour defectors could return, potentially adding 2pts to Labour’s score. Put those together and the UKIP damage to the Tories is just over 3pts: less than a quarter of Labour’s lead. How can you convince the UK to care about climate change? I’ve been arguing for a while that there’s been too little done to explain to the British public why they should care about climate change. If the problem is seen only to affect animals and people in other countries, campaigners will struggle to win mass support for action to tackle climate change. It has to be made real and personal, or many people just won’t care enough. But that raises a difficult question. If people don’t already think that climate change will affect them and their family, how do you persuade them they should care? Fortunately, a mega poll by MORI for Defra provides some answers and the starting point for what a campaign could look like. According to the UK Climate Risk Assessment, the two most important climate risks facing the UK are flooding and summer heatwaves; I will focus on these as the possible bases for a campaign. However, the poll shows a radical difference in how they are perceived. It won’t come as much of a surprise that most people in the UK think that flooding is the main risk from climate change (bear with me – it gets more interesting). Perhaps this is a product of how heatwaves and floods are distributed. Different parts of the country suffer floods at different times, and most serious incidents get news coverage – while heatwaves tend to hit the country in one go, so coverage is more concentrated. So floods may just be in the news more often*. But I don’t think that’s the full explanation, and here’s where it starts to get interesting.